For our homemade costumes, I was determined to dress up as Rey From Star Wars The Force Awakens . From there, I managed to talk each member of the family into dressing in theme with other characters from the movie. My daughter was the easiest as she loves to dress up as robots. (She was a Doctor Who Dalek last year.) So naturally she chose BB-8. My son was determined to be the bad guy Kylo Ren. And my husband didn’t care so I chose Han Solo for him. In the end, we had our family Star Wars costume. 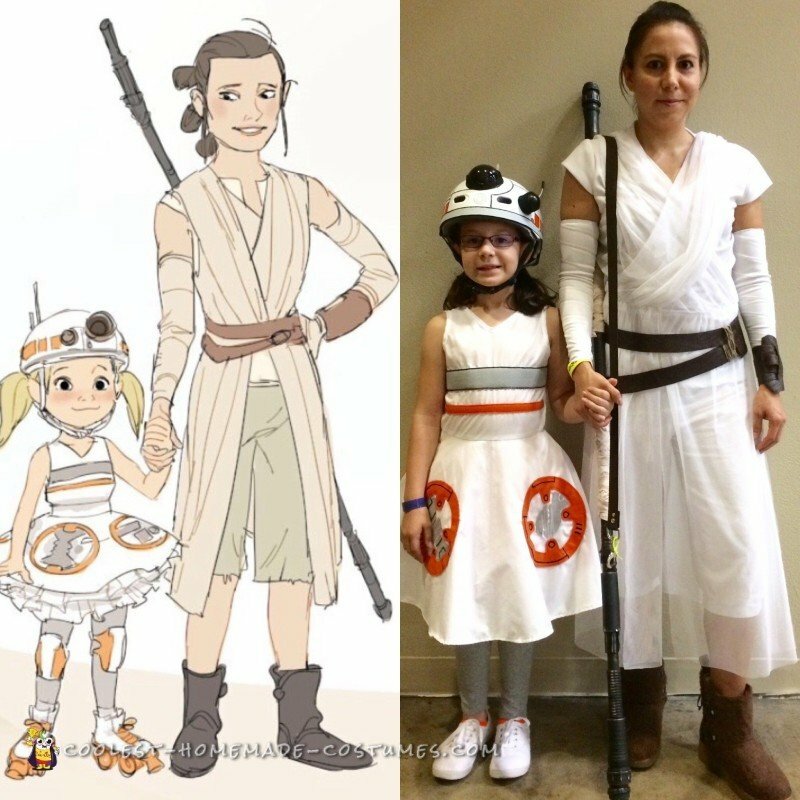 I found an artists’ reference image online that featured Rey and BB-8 that started it all. It kind of just grew from there. Almost all pieces featured in the pictures were homemade. The exceptions are Han Solo’s blue pants and knee-high boots, and Kylo Ren’s black plants, mask, and lightsaber. I used the following fabrics: Rey (mesh, jersey knit, linen, and brown vinyl); Han Solo (black denim and poly-cotton blend); BB-8 (cotton broadcloth and felt); Kylo Ren (black poly cotton blend). Using a sewing machine, I made the entirety of Rey’s costume, Han Solo’s vest and shirt, the BB-8 dress, and Kylo Ren’s robes. I used various sewing patterns to help create the general shape of the costumes. Some required the use of ingenuity to figure out. Such as the Han Solo vest for which a pattern doesn’t exist and I had to play with the pocket sizes and shapes using image references; and the Kylo Ren costume which only has a pattern in the men’s sizes currently. 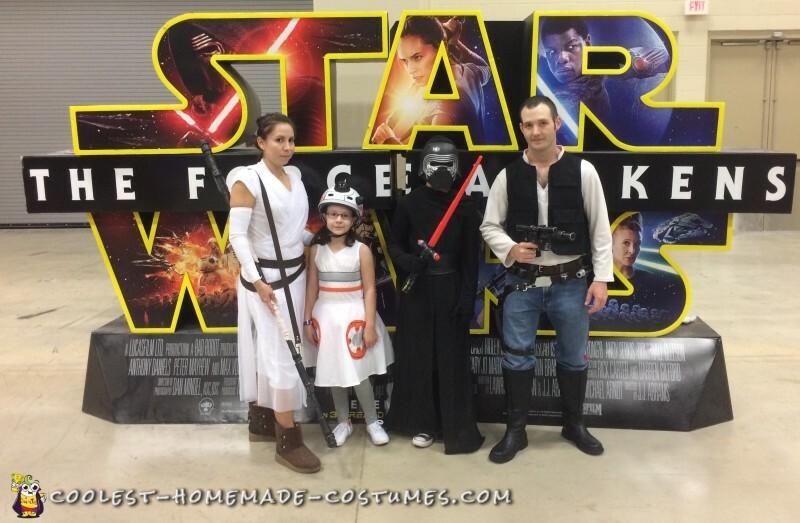 My husband and I tag-teamed all the accessories which included making Rey’s staff weapon and modifying her boots, decorating BB-8’s helmet, and creating Han Solo’s accessory belt and painting the blaster. 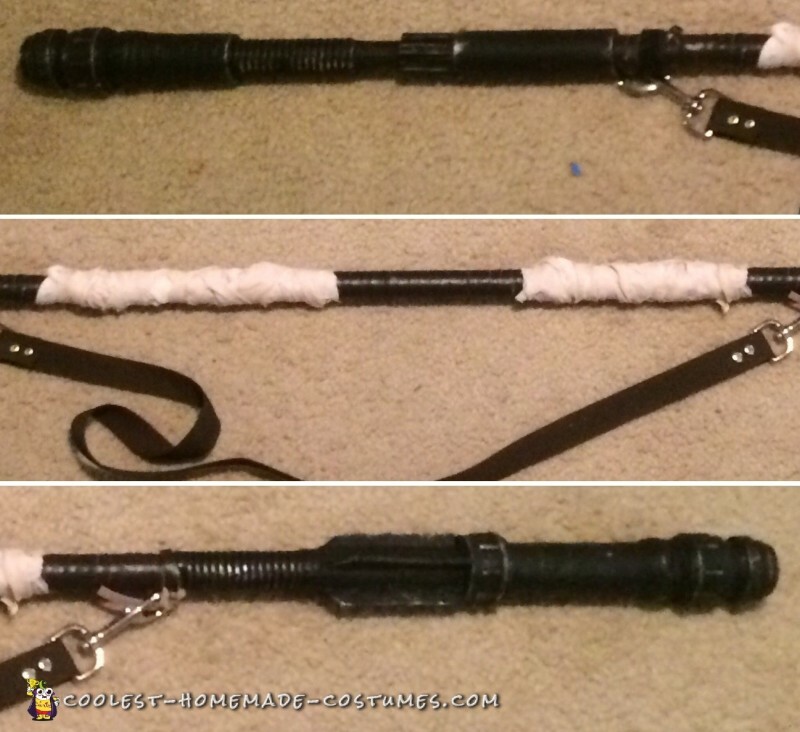 The staff weapon was made out of lots of PVC pieces from the hardware store, some craft foam for details, leftover hand-dyed linen and brown vinyl fabric for the hand grips, and brown painted nylon strapping with gold rivets and clips to hold it all together. It was painted with black Flexi-dip and weathered with metallic spray paints using a sponging technique. Han’s DL-44 blaster was a store bought orange/white toy gun which we painted primer black and weathered with metallic spray paints. 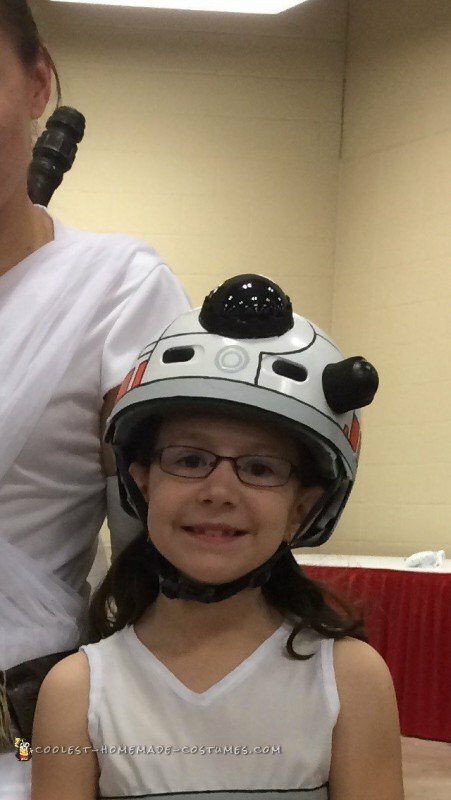 The BB-8 headpiece was a black bicycle helmet we painted primer white, detailed in acrylic paints, and added clear Christmas ornaments, spare wire, and an empty glow stick for the lenses and antennas, then clear-coated it. 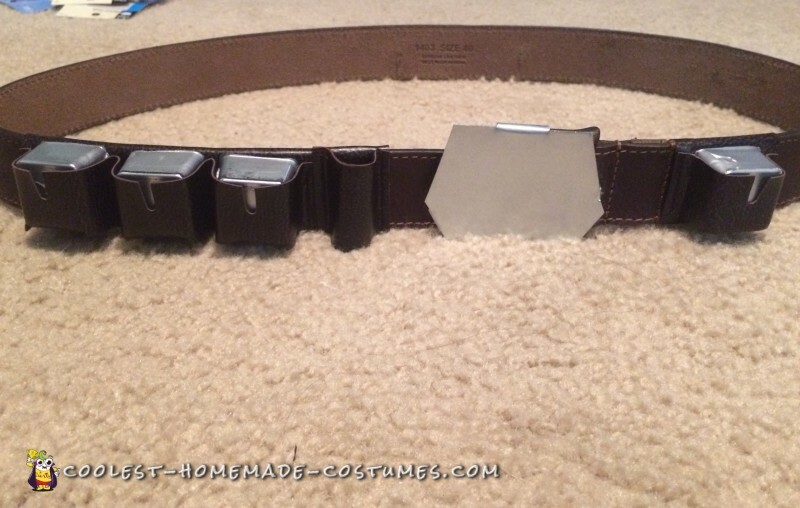 The Han Solo belts were made from store-bought brown leather belts as a starter. I cut/sewed pockets and the holster using brown leather fabric and attached them to the belts using various metal rivets, clips, hand stitches, and glue. I added accessories such as the CO2 canister painted green, some little plastic boxes painted silver, and some trimmed sheet metal for the two belt buckles (front and back). 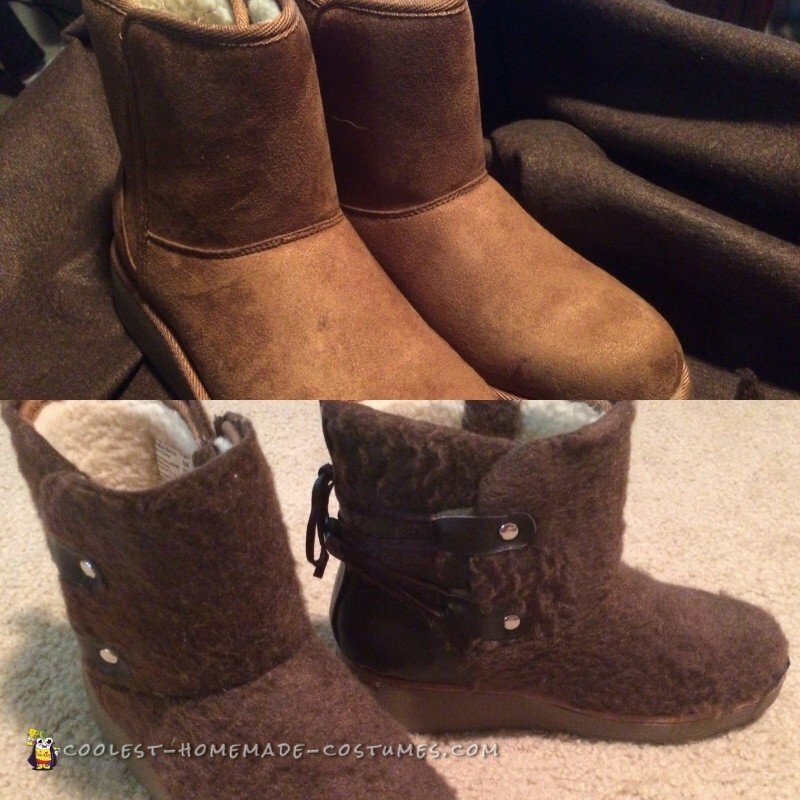 Rey’s boots were cheap light brown ‘Ugg’-style boots I found at Payless. I cut them up and covered them in chocolate brown wooly felt. Then I added nickel rivets and spare brown leather pieces to create the riveted loops for the laces. Those were long, thin strip of brown leather leftover. For the finishing touches, I used Black permanent marker on bright red 1″ ribbon to create the stripes on Han Solo’s pants. These were hand sewn on since I couldn’t use a sewing machine. My hair was also styled in Rey’s usual triple bun look featured in the movie using 4 hairties and 15 bobby pins. My kids especially liked the costumes. They really like having custom home-made costumes to brag about to their friends. And my husband was sincerely impressed in how well the Han Solo costume came out. I had no patterns at all for it and had to make it all myself using references from the web. Most specifically for the vest pockets and the belt pockets. Even if we don’t win, we had a lot of fun creating and wearing the costumes. Besides, we’ll probably end up wearing them to the opening of the next movie Star Wars Rogue One. We’ll be the best-dressed there.